Just as "traditional," i.e. 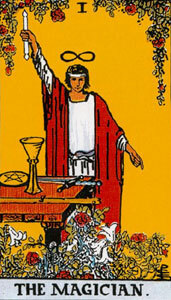 Nineteenth-century English, non-Jewish opinion on the tarot attributions of the seven double Hebrew letters appears to be a mix of ideosyncratic readings of the Sepher Yetsira and private "inspiration," traditional assignments of the seven doubles in the Cube of Space seem to draw on the same sources. The assignments used here are simply those of a consensus of versions of the Sefer Yetzirah. It should be noted that none of the versions of the S.Y. cited by Kaplan support the "traditional" assignments of the seven double letters. 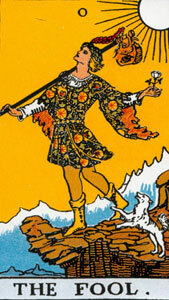 See Tarot Natural Order. The central mystery of the Cube of Space is at its center. The popular assignment of the World to Tav misses the inner meaning of both symbols and surpresses a central theme of the Qabala with vital significance for Western thought. In some ways it seems so obvious. 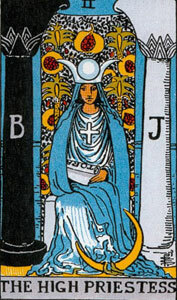 Why isn't the High Priestess's Sanctuary, with Moon at her feet and the Tau cross on her chest seen for what it is, and where it is? One source of error appears to be in not understanding fundamental aspects of the Cube. The six impersonal planetary energies represented by the faces of the Cube of Space are three uni-directional flows -- from above to below, from east to west and from north to south. These energies pass through us. They appear to be double according to our orientation to them, which we experience as the contrary qualities. The Moon's, our psyche's, true place is at the center of the Cube of Space, where we experience the six energies passing through us, while the seventh dwells within at the center of our being, the eye of the needle. When Saturn is placed here the vital significance of Saturn is missed and the Moon, our own point of view, is displaced outside of us (Golden Dawn). The secret of Tav, the Moon, and hence our psyches as the Sanctuary of the cosmic energy of Aleph remains hidden, along with the secret behind the veil, endogenous creation. And the recognition of the importance of feminine psychological transformation in personal and social development is delayed a little longer. Why put the Sun in the South in the place of Mercury, Kawkab, except to live with the mistake of assigning it to the double letter Raysh? What is more obvious than the Sun in the West? At the 8th Sephira, Kaf, 20, forms Hhamah, 8.40.5 Five of six of the versions of the Sepher Yetsira cited by Kaplan, assign Kaf/Khaf to Hhamah/Sun. These "assignments" seem possible only if one ignores the source Hebrew tradition that is the basis for the Sepher Yetsira (Sefer Yetzirah) and the Cube of Space and puts in its place a "magickal" substitute which puts the Magician above everything and looks suspiciously constructed to promote special interests and hide intolerable meanings. 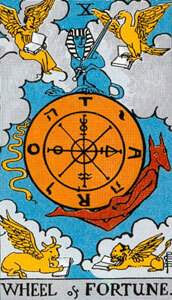 Above-Below: Bayt, 2, forms Saturn and is sealed twice with YOD-HAY-WAW. The World belongs here as the containing energy formative of Shabatai. The opposite planet is Tsedeq, Jupiter, formed by Ghimmel, 3 and symbolized by the Wheel, as ladden with 3-symbolisim as the World is with the number 2. This is the existential axis, confirmed by the seals YOD-HAY-WAY and YOD-WAY-WAY (Yod = Existence). East-West: sealed by HAY-YOD-WAW (7/Meadim-Mars) and HAY-WAW-YOD (8/Hamah-Sun) is the axis of life (Hay = Life). 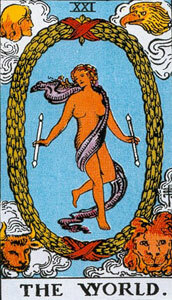 This is symbolized by the futurity of Meadim and the unconscious structures of Hamah. 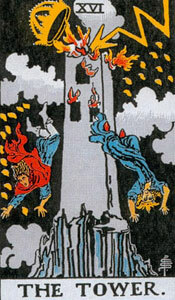 The Tower, not the Empress, is the appropriate symbol for our uncertain future, with which we are often at odds and to which our response is either Olet, Folly, or Hhokmah, Wisdom. To place the Empress here is to substitute a dreamy future for the conflicts and realizations of the Tower and to obscure the inner meaning of Meadim, where Adam finds himself in the waters of existence. North-South: Phay/Venus (no version of the Sepher Yetsira / Sefer Yetzirah assigns Mars to Phay); the origin of the sensual influx ("Evil") from the North, seems obvious. 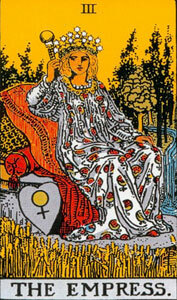 The Empress is the closest analog to "Mother Nature" in the Tarot and represents the pool of undifferentiated developmental potentials (sum of probability states). Pay/Phay (level of unconsciousness) form Nogah, 50-6-3-5 (existential-senusal-impulse-living), the ground of our material experience and 10th sephira. This axis is sealed with WAW-HAY-YOD (10/North) and WAW-YOD-HAY (9/South) and is the axis of interpenetration (Waw) of energies. Psychologically, it is sense-perception. For Blake this is the Tharmas/Senses-Urizen/Reason axis. 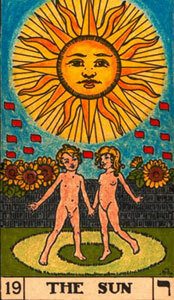 The energy which responds to Nogah, the opposite binomial, South/Raysh, 200, forms Mercury and is symbolized by the Magician, not the Sun. Mercury, Kawkab, 20-6-20-2, is our cognitive response to sensual experience, and shows the inner structure of thought as containing the factualities of material and psychic experience in interpenetration. Again, this seems obvious, at least after the thought. (What else could a thought be? ).